His friends and family gathered in Section 54 of the cemetery on the gray and blustery afternoon. 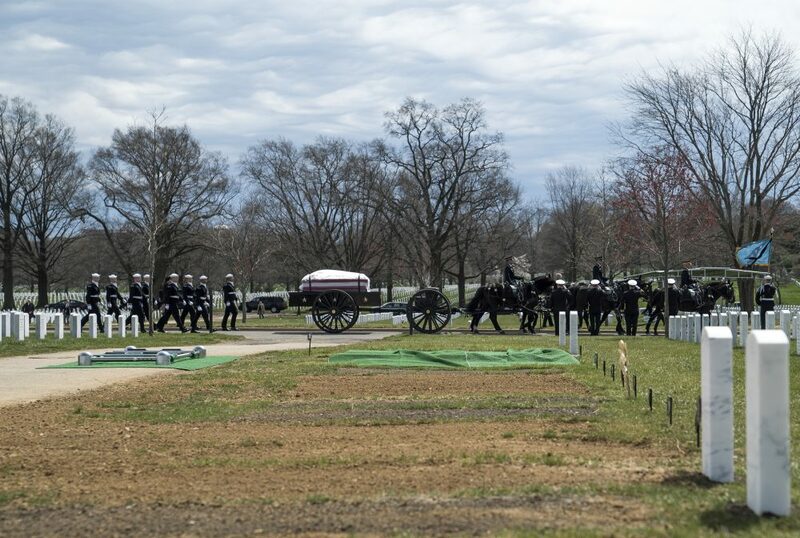 The U.S. Navy Band played as a horse-drawn caisson carried Hudner's casket to the grave site. 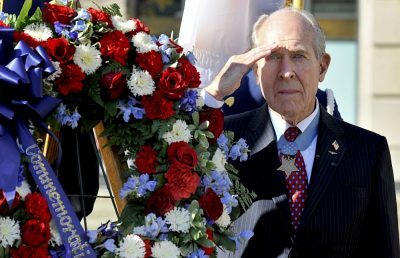 His place in American military history was evident in the people who gathered to pay their respects. Joseph Dunford — a Boston native, Marine general and now chairman of the Joint Chiefs of Staff — was there, as were a dozen other Medal of Honor recipients and Francisco Urena, a former Marine who's now state secretary of veterans services, a job Hudner used to hold. Young pilots, members of Hudner's former squadron, soared overhead in F-18s. 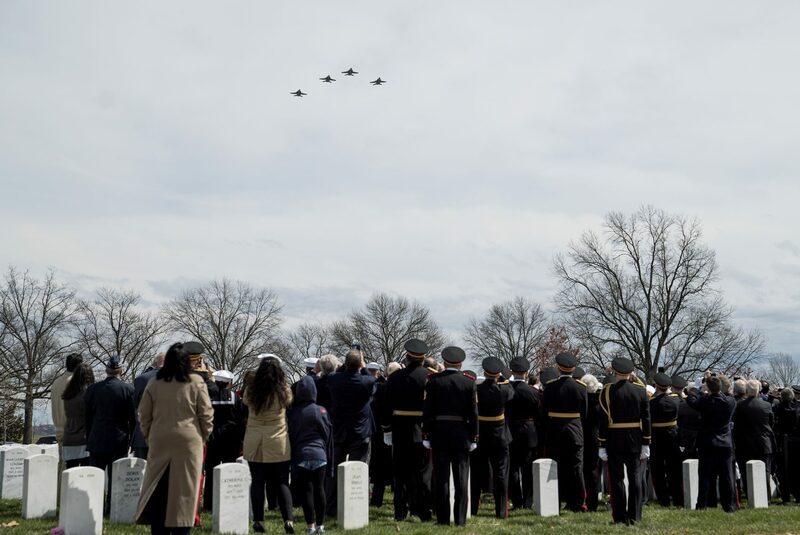 They flew in the missing man formation — appropriate, because this isn't just Tom Hudner's story. 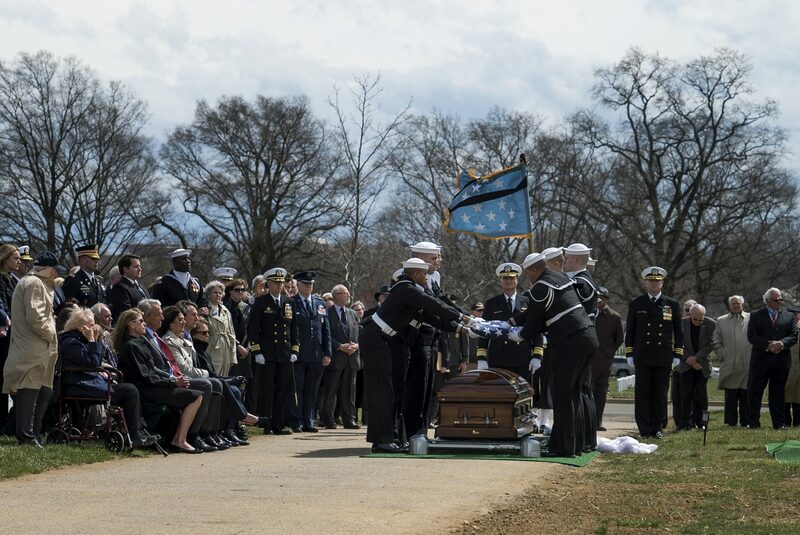 "I think it's just great closure, like being able to see the ceremonial burial that Jesse Brown never got to have," said Jessica Knight Henry, granddaughter of Ensign Jesse Brown. 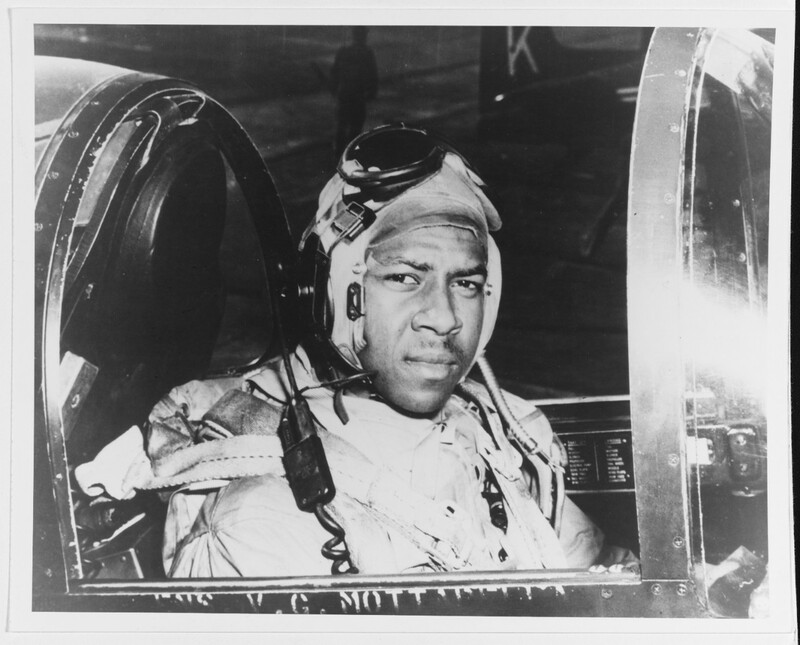 Brown was the son of Mississippi sharecroppers who was the Navy's first black pilot. 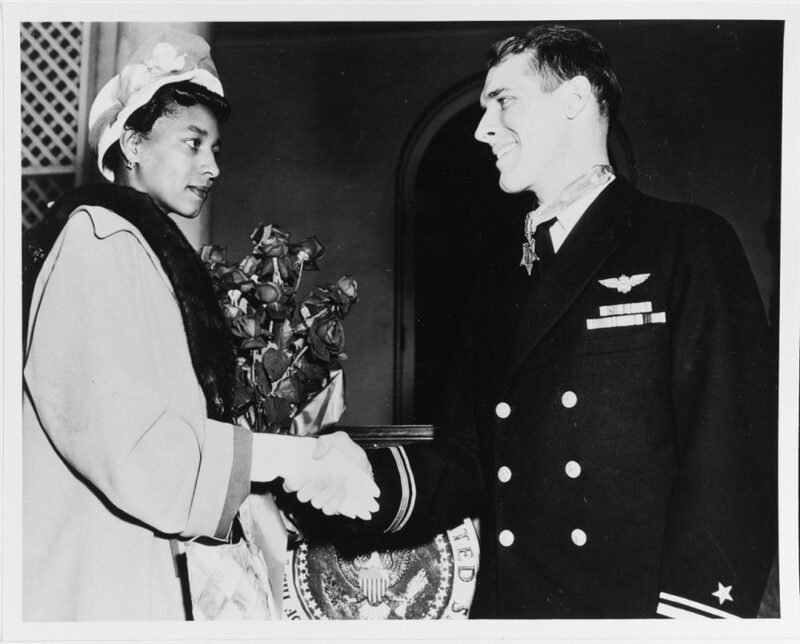 And it was Brown that Hudner, a white man from Fall River, Massachusetts, tried to save on a frozen hillside in Korea in 1950, the act that earned him the Medal of Honor. "On that day, Dec. 4th, 1950, he said he was doing his job, helping out a squadron mate who needed help. In his eyes it wasn't an extraordinary act. 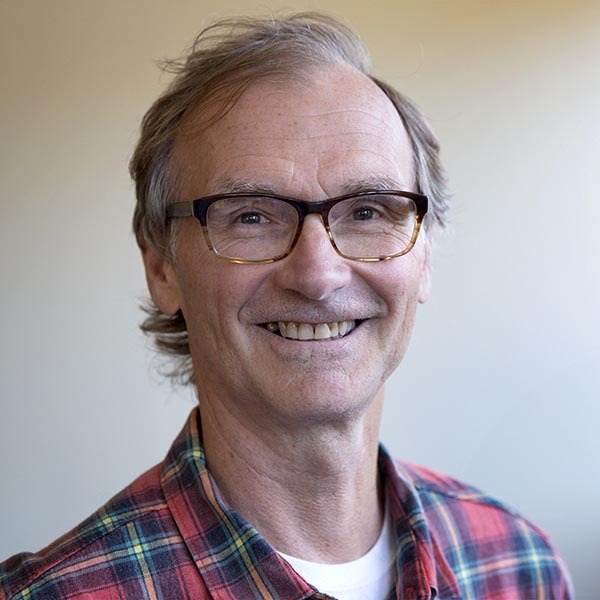 It was just the right thing to do," said Tom Hudner III, speaking at the service. 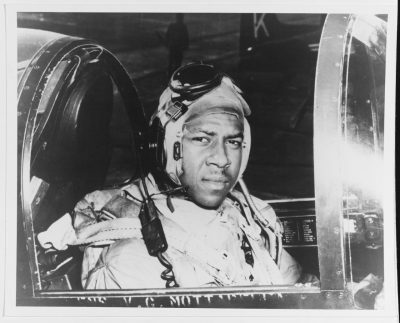 On that day, Hudner had crash-landed his own plane to try to save Brown, who had been shot down. Brown was trapped, and Hudner tried for 45 minutes to free him. It was freezing cold and getting dark and the helicopter that had landed to pull both men out couldn't fly at night. So Hudner had to make an agonizing decision to leave, to save his own life. "You know, I think he probably felt some responsibility to help carry on Jesse's legacy," said Hudner III. "Jesse's own story is incredible, and what he achieved and the adversity that he overcame is incredible." Jesse Brown's remains were never recovered. But Knight Henry says his loss forged a friendship that outlives both men. "You know they were tied together in that selfless act that Tom made, but I think it's reflective in the relationship that we still have with the Hudner family. So the stories of these two men live on long after they both have sort of passed here," she said. Jesse Brown was 24 when he died. Thomas Hudner was 93.